Drawing workshops run by the University of Melbourne Student Union with Museums and Collections on campus are an important means to hone artistic skills. 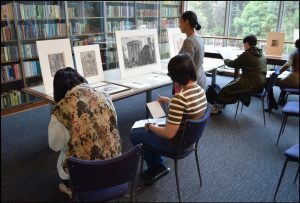 Students in the workshops visited the Medical History Museum, the Dark imaginings exhibition, the Baillieu Library Print Collection and the Grainger Museum and drew objects on display, as well as items that had been brought out from storage. Photo: Alice Mathieu, Arts Programs, UMSU. 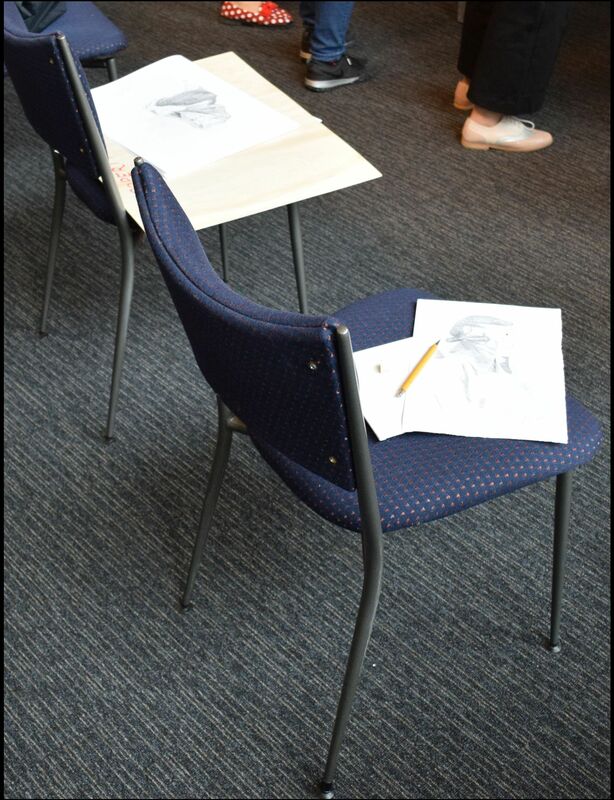 The students had the opportunity to draw with pencils and experience another medium, that of silverpoint, a method which grew from Medieval manuscripts and which employs the use of a metal stylus on a prepared ground. 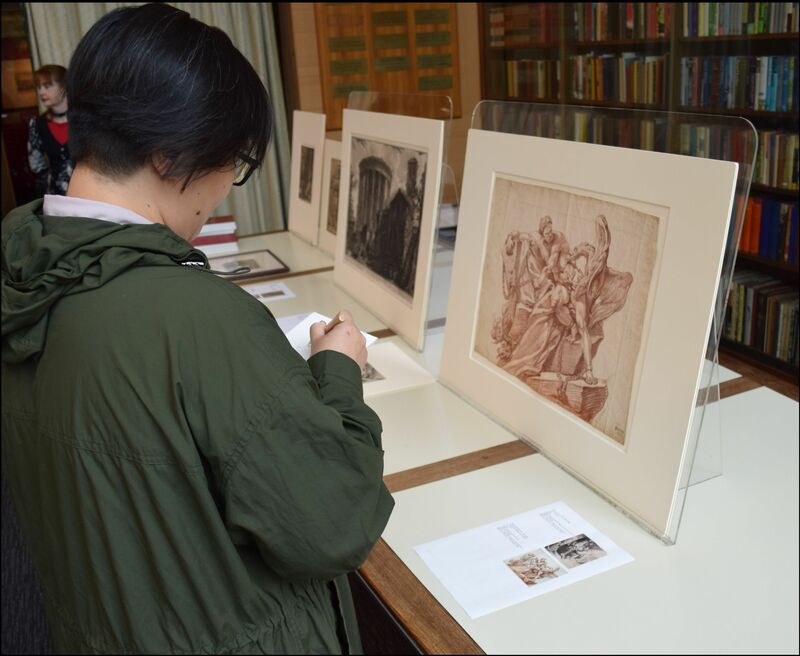 Drawing cultural collections is an opportunity for artists to get out of the studio, and for the objects it is an opportunity to come to life through the student’s creative efforts. According to Homer, there existed a tribe of Pygmies, or diminutive people one-and-a-half feet tall, who were constantly at war with cranes (The Iliad book III). This Greek myth recounts how these Pygmies lived in caves and rode about on rams. Annually the tribe partook in a great war with the cranes, with the objective to steal and eat many crane eggs and chicks, thereby keeping the vicious crane population in check. 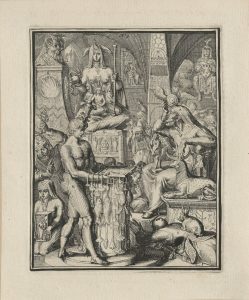 Something rather curious takes place within the set of engravings, for Homer’s Pygmies seem to have found their way from one plate into another. 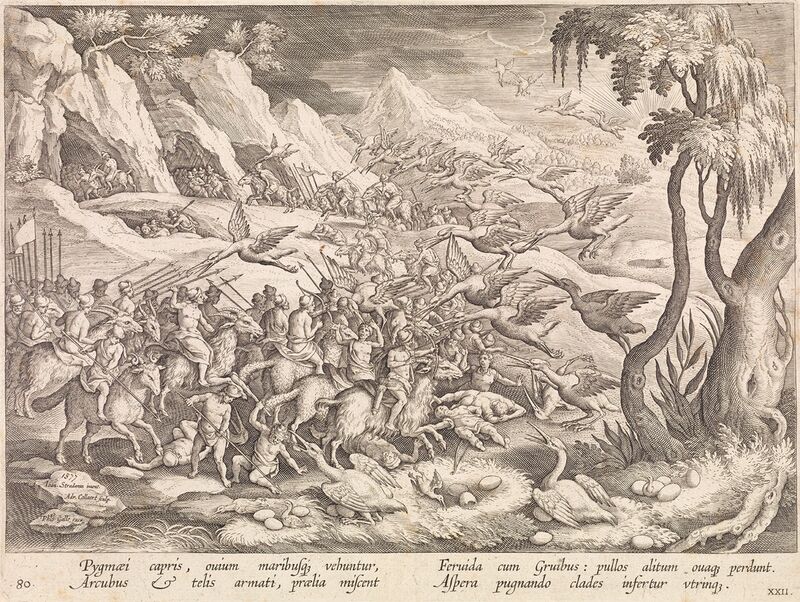 In Cavemen chasing elephants, several tiny individuals, outfitted in the same garb as the Pygmies in plate 22 (hat and waistcloth), have launched an attack on some unsuspecting elephants. 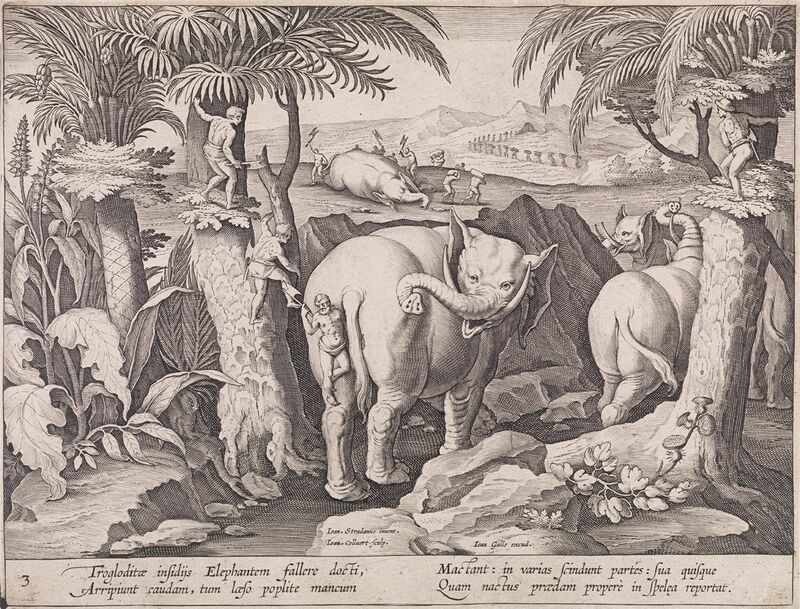 In book eight of Pliny the Elder’s Natural History we read that: ‘The Cavemen on the frontier of Ethiopia, whose only food is elephant meat obtained by hunting, climb up trees near the elephants’ track and there keep a look out for the last of the whole column and jump down on to the hind part of its haunches’ [2.] A quote which is very aptly illustrated by the engraving. 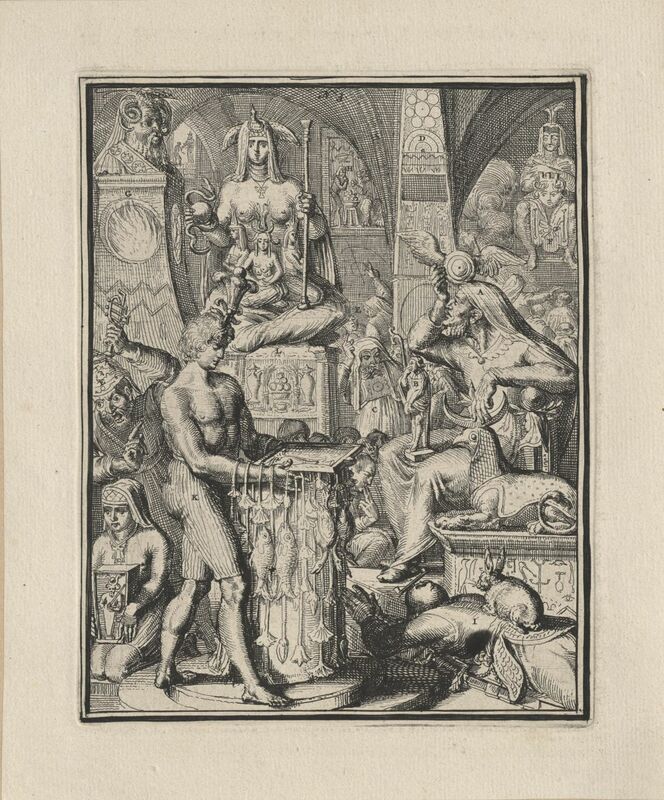 With the exception that the Ethiopians seem to have been depicted as Pygmies. Homer’s tribe were said to live in Okeanos (Oceanus), a location sometimes interpreted as the Nile, Africa, where cranes migrate. The cranes ‘make for the rivers of Ocean to bring death and destruction to the Pygmies, launching their wicked assault from the air.’ [3.] 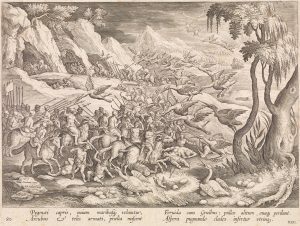 So it seems that the writings of these two ancient authors, Homer and Pliny, were combined in the creation of these two engravings. 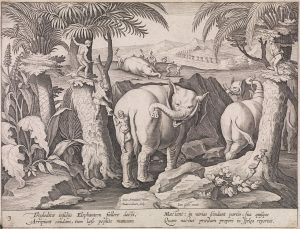 Whether either literary source was based on factual evidence or fantasy concerning the existence of an ancient Pygmy tribe, the texts and the engraved series stimulates a hunger to learn more about exotic lands, people and animals. Dark imaginings: Gothic tales of wonder, a new exhibition in the Noel Shaw Gallery, was officially launched on March 1st. 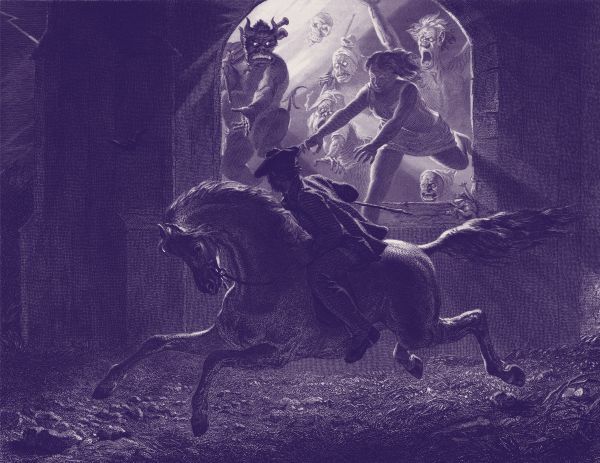 Dark imaginings explores the emerging 18th century Gothic sensibility in literature, art and music, primarily as represented in the rare book, print and music holdings of the Baillieu Library. 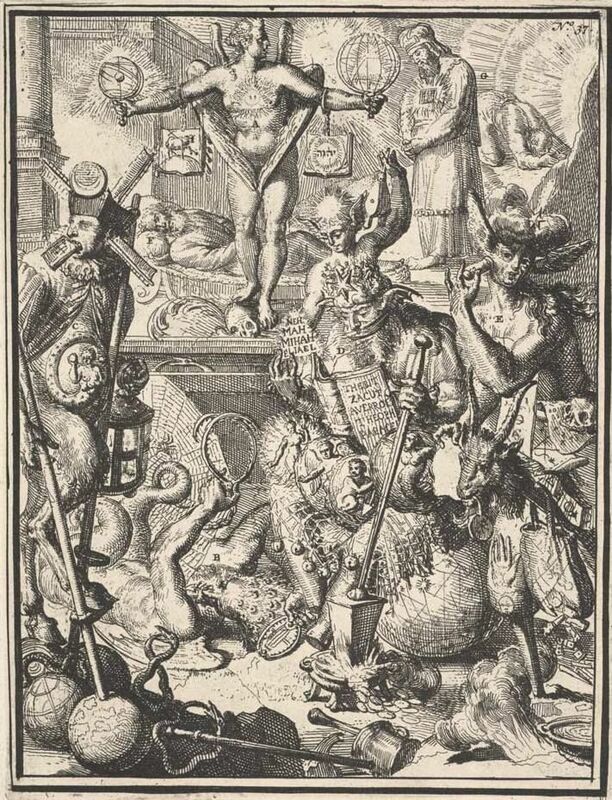 This heightened creative mode abstracted nightmarish images form an earlier medieval (or ‘Gothic’) age, and fused them with a Romantic focus on imagination and emotion, to create a literary and artistic tradition of thrilling originality. The exhibition celebrates several important 2018 anniversaries, including the publication of the first edition of Mary Shelley’s Frankenstein, and the birth of Emily Brontë, author of Wuthering Heights, and references aspects of the Gothic into the 19th century and beyond. 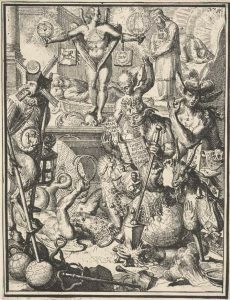 Sitting alongside the exhibition is a new and enthralling website featuring Gothic research by scholars of the Gothic, postgraduate students and Special Collections curators. There is also an exciting opportunity for all students of the University of Melbourne to enter the micro-story competition. The exhibition and website are a timely celebration of all things wild, gloomy and fearful. As part of the Miegunyah bequest funding, engravings after Andrea Mantegna (1431-1506) – much sought after by students of Renaissance art – were conserved. Adele Barbara explains her treatment of one these important works of art. Initially, it was thought there was only one thick backing layer on the engraving of The Risen Christ with St Andrew and St Longinus that had to be removed. Mechanically removing this backing with a scalpel, however, uncovered another, very thin lining that had been fully adhered to the back of the work. 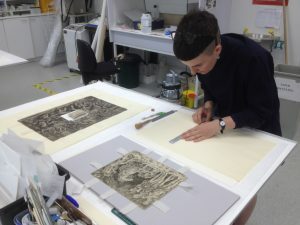 A series of investigations were conducted in order to determine what exactly was bonding this lining to the print and the best way of removing it safely. To discover what kind of adhesive was used to bind the lining to the back of the work, a series of spot tests were conducted. Spot testing in conservation not only helps to identify materials, but can contribute to the development of a treatment methodology. For this work, both a potassium iodide test and a biuret test was used to assess what kind of adhesive was used. Results indicated that the adhesive was starch based. This series of spot tests helped to troubleshoot the next stage of treatment; the separation of the print from its lining. In order to separate these layers without disrupting or damaging the print, the starch-based adhesive had to gradually softened. 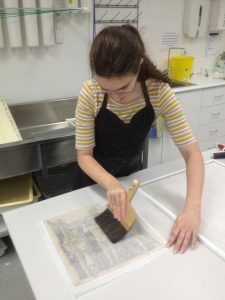 To achieve this, the work was gently humidified before it was carefully placed faced up on a piece of thick, wet blotter. To ensure good contact between the back of the work and the blotter, a sheet of Bondina tissue was placed on top of the work, followed by a sheet of glass. This sandwich of blotter and Bondina allowed moisture to gradually permeate through the layers without causing visual or dimensional change to the print. 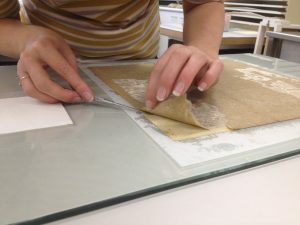 After four hours, the work was removed from beneath the glass and hand tools were used to gradually peel back the lining. Some areas of the lining, however, needed a little more encouragement. To help ease the two layers apart, a heated spatula was applied to the work with a wet blotter to further soften the adhesive. 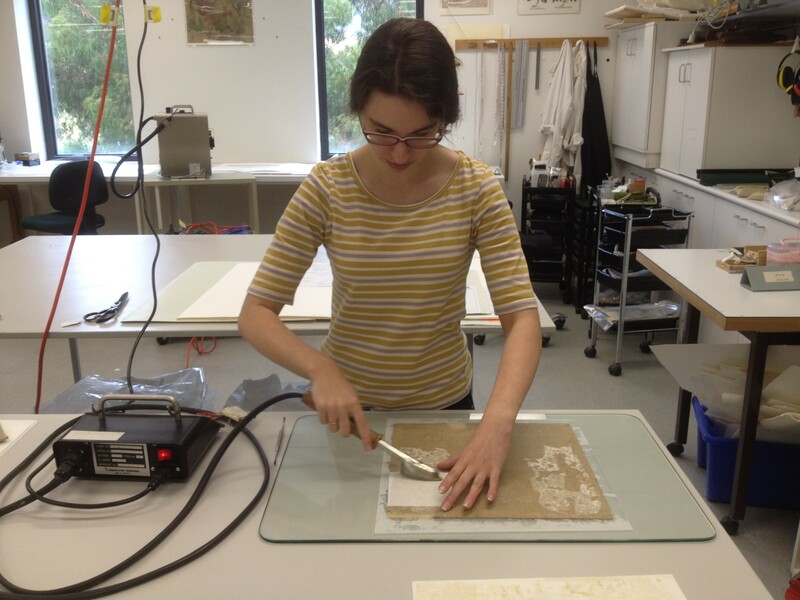 Hand tools could then be used to separate the layers without damaging the print. 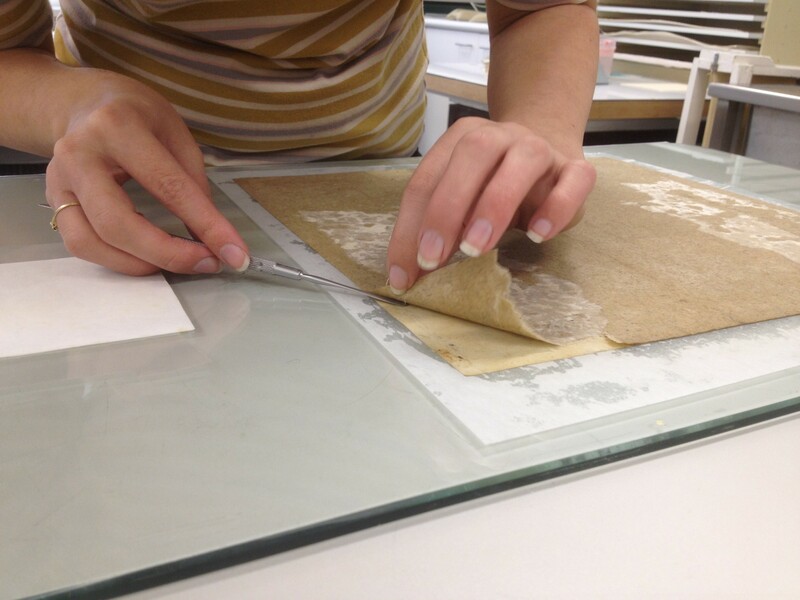 Once this lining was removed, the work could be thoroughly washed and flattened to remove dirt and impurities. 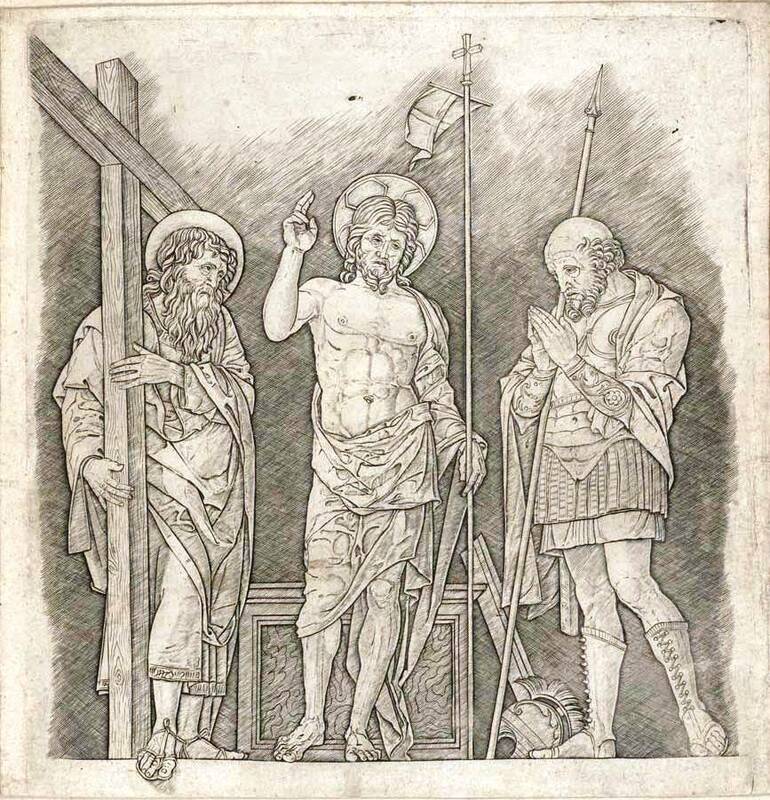 Finally, The Risen Christ and other works in the Baillieu’s Print Collection were mounted. Small Japanese paper hinges were attached to the works, which were then joined to inlay paper and then into their own window mounts. This very precise method of mounting allows both sides of the prints to be viewed by students and researchers safely and securely.